A Texas judge has ordered Carnival Triumph arrested when it returns to Galveston on Saturday (March 31, 2012). The federal order is in connection with a $10 million lawsuit filed against Carnival Corp by the family of a German who died aboard Costa Concordia. The order was issued on Friday by a federal judge in Texas, and as of now, the ship will be held when it turns around in Galveston on Saturday. The order says Carnival may offload passengers and cargo, and the ship will be allowed to move to a different pier if necessary. The order says the ship will be held until a "prompt hearing" can be held when Carnival can argue why it should not be held until the suit is resolved. Carnival has not yet commented. No doubt, the line is working to get a hearing on Saturday or to get a judge in a higher court to overturn the order. If Carnival doesn't prevail, Saturday's sailing will have to be canceled. Unconfirmed reports say passengers arriving for today's sailing are being told the situation is a matter of "miscommunication," and preparations are being made for today's sailing. Carnival has just issued a statement which says that the company is "working through appropriate legal channels to resolve [the situation]." Carnival says they are "optimistic that the issues regarding Carnival Triumph will be resolved and the ship will depart on its scheduled voyage later today." Passengers arriving at the terminal for embarkation are now being given a letter explaining the situation. Carnival is still proceeding in anticipation that the ship will be allowed to sail today. Passengers wishing to cancel, at this point, are being assessed the normal financial penalty. Carnival confirms they are proceeding normally with their embarkation process aboard Carnival Triumph, and passengers are boarding, and they are still working to have the ship released. They say they are still optimistic that the ship will be able to sail today. Legal sources tell us the first big hurdle is going to be getting someone in the federal system to work on the weekend, especially when it's not a life or death matter. We have no confirmation that has happened yet. Of course, that may not be Carnival's first choice of actions, but the obstacle of getting the judge to hear the motions today also still exists. Carnival source tells CND agreement has been reached, and Carnival Triumph will be released and sailing "soon." Scheduled sailing time was 5pm ET. Still awaiting official statement and confirmation when the ship sails. Webcam confirms Carnival Triumph is untied and leaving the pier. Carnival has issued a statement saying, "The mater involving Carnival Triumph has been resolved, and the ship has just departed." They said the ship will follow it's normal itinerary. There was no information on HOW they resolved the issue, however. A fire broke out in the engine room of Azamara Quest at 8:19pm on March 30 (local time, 8:19am on March 30 eastern daylight time), while the ship was sailing 200 miles off the coast of Balikpapan (Borneo), Indonesia. RCCL (Azamara is a brand of Royal Caribbean Cruises, Ltd) said the fire was contained to that engine room and quickly extinguished. The company said that preferring to err on the side of caution, the passengers were called to their muster stations. The ship initially switched to emergency power, so it was without propulsion or most hotel services, including air conditioning. The RCCL spokesperson said there were no injuries to passengers, but didn't have information about any injuries to crew members. RCCL said the sea conditions were calm, and the mood aboard among passengers was also calm. Azamara Quest left Hong Kong on a 17-night cruise on Monday, March 26. It was to conclude at Singapore on April 12. The ship was sailing from Manila to Balikpapan at the time of the fire. RCCL does not yet have information on where the ship will go now. Azamara Quest is 30,277 gross registered tons, and carries 694 passengers double occupancy. Updates will be posted on this item (below map). Click the blue pins for the names of the points. Engineers have managed to restart one engine. That has allowed many hotel services to be restored - air conditioning, running water, plumbing, refrigeration, food preparation. Engineers are continuing to work on restarting propulsion. Updates will continue to be posted on this item. Engineers aboard Azamara Quest have not yet been successful in restoring the ship's propulsion but are continuing to work on it. The Philippine Coast Guard said they have two vessels and a patrol boat en route to Azamara Quest's location. They should reach it "late Saturday" (local time, which would put it at early Saturday eastern time). Once they do, the ship will sail to Sandakan (Sabah), Malaysia where passengers will disembark and fly home from there. There will be no estimate on the arrival time until the ship can get underway. The situation is made more urgent by the medical condition of one crew member who needs shoreside medical care due to injuries he suffered in the fire. He will be transported to a hospital once the ship arrives in Sandakan. Five other crew members suffered smoke inhalation and are being treated in the ship's medical facility. The balance of the current sailing will be canceled, and information about the impact on the April 12 sailing will be forthcoming Monday, once more is known about the ship's mechanical condition. Passengers aboard the current sailing are being given a full refund along with a future cruise certificate in the amount of 100% of what they paid for the March 26 cruise. Azamara president and CEO, Larry Pimentel, is flying to Sandakan to meet with the guests and crew members personally. He is scheduled to arrive in Malaysia on Monday morning local time. Limited propulsion has been restored to Azamara Quest. The ship is proceeding to Sandakan at a speed of 3 to 6 knots. Arrival is expected in 24 to 48 hours. Azamara reports that the condition of the one severely injured crew member has improved but is still serious. Unconfirmed reports from passengers aboard continue to say the mood aboard is still upbeat, and there is limited power for hotel services. They say that basics such as air conditioning and water are up and running but some services such as elevators are not. The passenger reports say they were held at their muster stations for a total of about two-and-a-half hours yesterday, and the fire was extinguished within about an hour. Azamara Quest is continuing to sail toward Sandakan (Sabah), Malaysia at a speed of approximately six knots. The ship is now approximately 100 miles from Sandakan. The ship is now expected to arrive at approximately 10pm Sunday night (10am Sunday morning eastern time). There is a correction to earlier updates. The engineers have been unable to restart the air conditioning completely, although they are continuing to work on it. They were previously able to actually only start the fans to circulate the air, but they haven't yet been able to restart the compressors which provide the cooling. Azamara says that the mood aboard the ship is calm and upbeat. Azamara president Larry Pimentel is currently en route to Sandakan to meet personally with the passengers and crew. He is scheduled to arrive Monday morning. Azamara Quest arrived Sandakan, Malaysia this evening at 9:23pm local time. Passengers were given the option to remain aboard (up until Tuesday, if they wish) or transfer to a local hotel. Flight arrangements are being made for passengers' departure from Sandakan as expeditiously as possible. It appears most passengers will depart on charter flights to Singapore on Tuesday. The injured crew member was taken immediately to a local hospital for additional treatment. Azamara president Larry Pimentel is currently en route to Sandakan to meet personally with the passengers and crew. He is still scheduled to arrive Monday morning, local time (Sunday night eastern time). 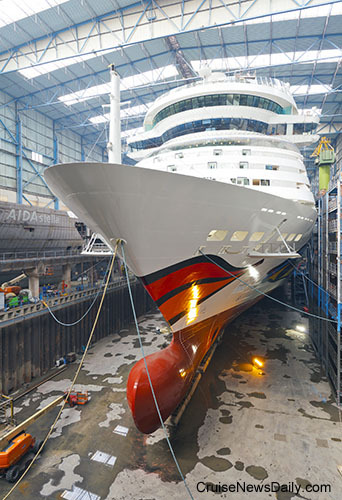 AIDAmar is shown in these photos inside the covered building dock yesterday at Meyer Werft in Papenburg (Germany). The ship will be floated out for testing and docking at the outdoor finishing dock on April 1, 2012. The ship is shown resting on blocks in the the drydock. It is being flooded today in anticipation of Sunday's operation. In the second photo, note the tug boat sitting on the floor of the dry dock already in position to assist in guiding the ship's bow during the float out. What's Royal Princess all about? Here's a very quick overview video Princess Cruises put together. In just 30 seconds, it really gives you the essence of what the ship will look like. Royal Princess enters service in June 2013. 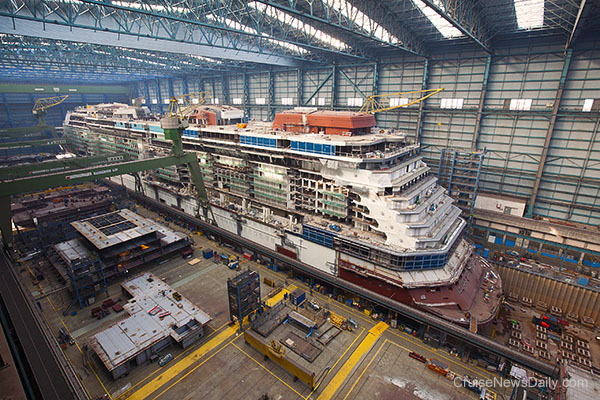 Construction of Royal Princess is continuing at the Fincantieri yard in Monfalcone (Italy). The atrium is beginning to take shape, and you can see the beginnings of decks 6 and 7 where the venues will seem to float mid-air. 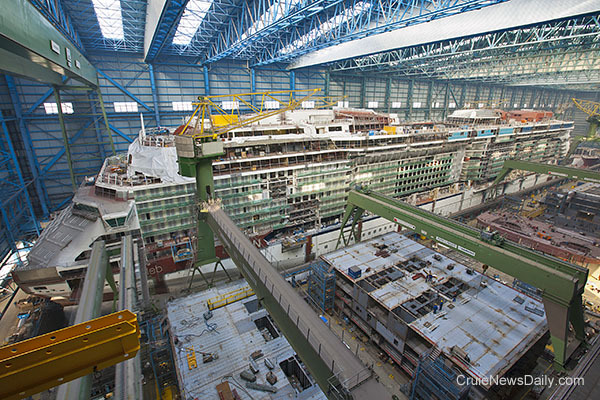 Royal Princess is scheduled to be delivered in the spring of 2013. Royal Caribbean's revitalized Rhapsody of the Seas returned to service today with a bunch of new features. You can see the new features brought aboard the "new" ship in the video below. 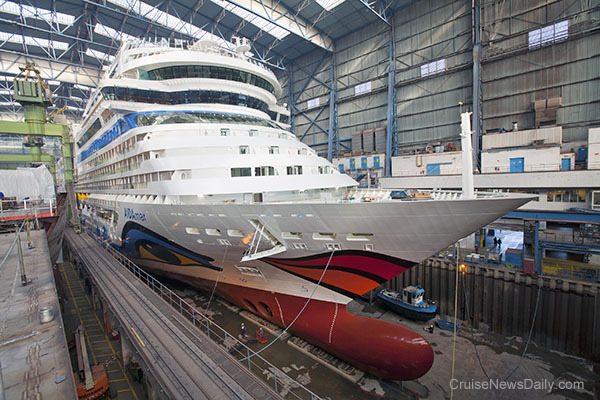 The complete story appeared in the March 29, 2012 edition of Cruise News Daily. With explosive growth in the cruise industry in Australia, more and more Sydney's harbor is in the news. For those who don't live there, it's hard to keep the geography straight. This map has the important cruise industry landmarks market. Click the blue pin for information. The Overseas Passenger Terminal has one berth that can accommodate the current generation of new large ships. The Garden Island Naval Base allows an occasional cruise ship to berth there, and the cruise industry has proposed to use it on a regular basis. The Sydney Harbor Bridge stands in the way of large (tall) ships sailing west of it. There is currently one berth that will accommodate smaller ships at the Cruise Passenger Terminal at Barangaroo. A new multi-berth cruise terminal is under construction at White Bay. This is opposed by the cruise industry because it is both in the wrong place with respect to roadway traffic patterns, and it doesn't solve the problem that many of the industry's new ships won't be able to use it. Repairs in San Juan to Caribbean Princess have proceeded as anticipated, and Princess has advised all passengers booked on the April 1, 2012 (Saturday) sailing that they should proceed to San Juan and embarkation will begin at 1pm on Saturday. The Carnival brands will push farther into Asia by establishing Carnival Japan. Princess will lead the way into the expansion into the Japanese-sourced market with Sun Princess being deployed to Japan for three months April to July 2013. Sun Princess is permanently based in Australia by the Princess brand. Carnival Japan, which will be based in Tokyo, will handle sales and marketing for Princess as well as other Carnival brands. Apparently the plan is for Princess to grow their presence in Japan, and other Carnival brands will follow with similar strategies. The onboard product on these initial cruises will be basically Princess, but customized for the local market much as it is on ship deployed for local sourcing in Australia. While the itineraries are developed for the Japanese-sourced market, they will be available for purchase worldwide. Itineraries for the 2013 season appear to be primarily 9- to 12-day sailings mostly from Yokohama. The programs will open for sale on April 16, 2012. At the same time Princess will launch a Japanese version of their POLAR online booking tool for travel agents in Japan. The Japanese programs and all other Princess programs worldwide will also now be priced in yen for sale in Japan. 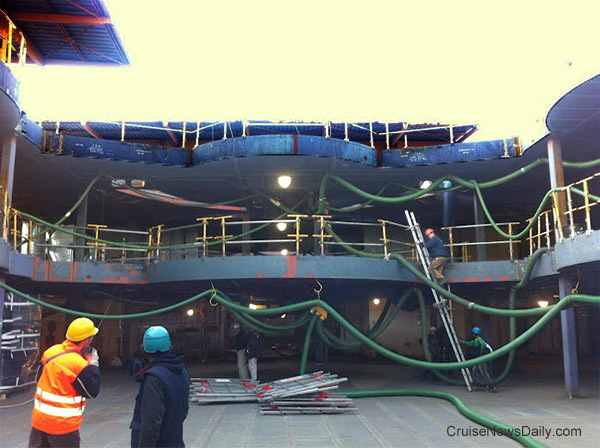 Details and perspective appeared in the March 27, 2012, edition of Cruise News Daily. 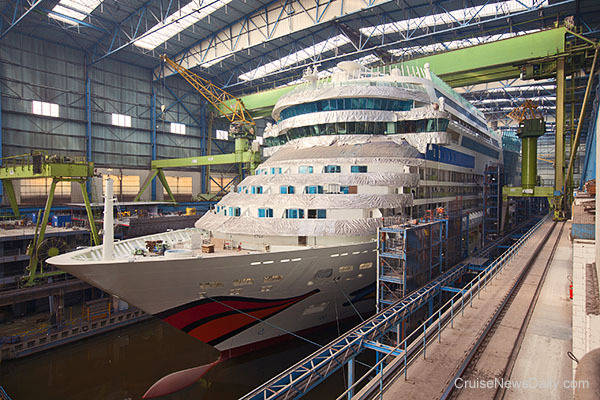 AIDAmar is nearing completion at Meyer Werft in Papenburg (Germany). 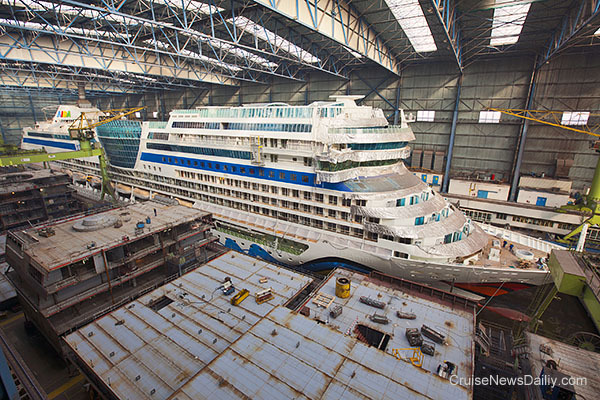 The yard has scheduled the ship to be floated out of the covered building dock on April 1 (2012). Interior work is normally completed during the next phase while it waits in the lagoon for its conveyance down the Ems River for sea trials. The conveyance is planned for mid-April, with delivery in May. AIDAmar is the sixth in the series of seven in the class. The last will be delivered in late 2013. Construction is well under way on Celebrity Reflection, the fifth and final in the Solstice class, at Meyer Werft in Papenburg (Germany). Actually it's about at the half-way stage. The keel was laid last September 13. Celebrity Reflection is scheduled to be delivered about six months from now and enter service on October 12, 2012. The ship's next event will be the float out from the building dock, scheduled for mid-August, and its conveyance down the Ems River scheduled for mid-September.